All the 7 color variants available for Maruti Ciaz has been listed in detail along with the photos of the car for each color option. Check it out. The all new Maruti Ciaz is available in White color variant (Pearl Snow White) . Check out the photo of all new Maruti Ciaz in Pearl Snow White Color variant. The all new Ciaz from Maruti Suzuki is launched in attractive Red color option which is also known as Pearl Sangria Red color. You may check the photo of all new Maruti Ciaz in Pearl Sangria Red color option above. Get Maruti Ciaz for Test Drive! Provide your details so that we can arrange a test drive of Maruti Ciaz for you at your city! The all new Maruti Ciaz is offered in Grey color otherwise called as Metallic Glistening Grey color . Check out the photo of all new 2017 Maruti Ciaz in Metallic Glistening Grey color variant above. Maruti Suzuki Ciaz is available in Silver color (Metallic Silky Silver). This is how the all new Maruti Ciaz looks like in Metallic Silky Silver color variant. Maruti Ciaz’s often seen character color is Brown color (Metallic Dignity Brown). Maruti Ciaz is available in attractive brown color variant which is officially called as Metallic Dignity Brown. You may find the photo of all New Maruti Ciaz in Brown color variant above. The all new Maruti Ciaz is available in Nexa Blue or Stargaze Blue color option. Maruti Ciaz in Blue color is a brand new addition and it was absent previous year. Check out the photo of all New Maruti Ciaz in Nexa Blue Color or Stargaze color (Blue). Last, but not the least, the all new Maruti Ciaz sedan is offered in pearl midnight black color option. Maruti Ciaz in Black color looks terrific. You may find the photo of all new Maruti Ciaz in Midnight Black color option above. This completes the list of all new Maruti Ciaz colors. 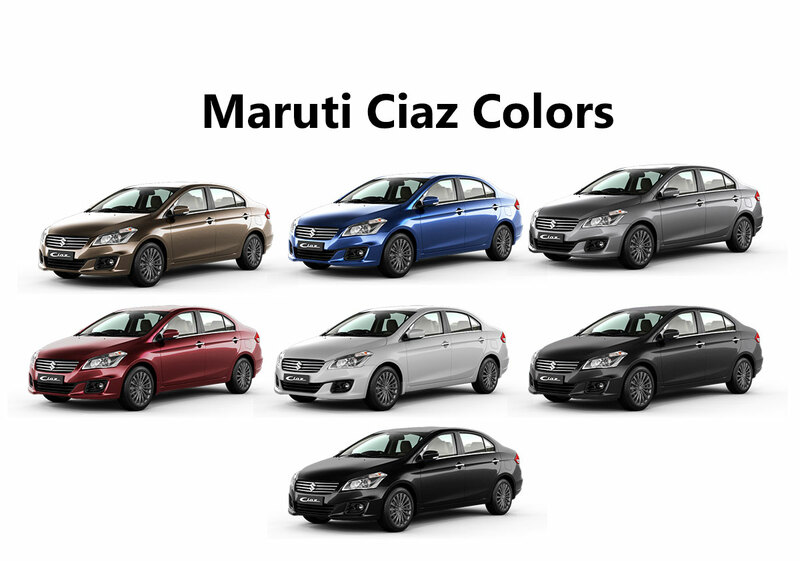 Which Maruti Ciaz color option is your favorite? You can comment your color option for Maruti Ciaz by taking part in the roads discussion forum.